I am a born pessimist, but over the past few years I have experienced how an optimistic view on life can make things a whole lot easier. Incidents over the past month reminded me that the pessimist is still lurking in the shadows. "You're generally seeing things too dark. Way too dark", said my painting teacher Trudy, followed by the advice to compensate for that. So, I struggled painting things lighter than I actually saw them, and yet, my homework painting of a yellow pepper made Trudy believe it was actually orange (now, the pepper had started to rot while I was painting, which did not really help either). 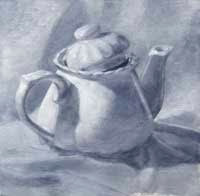 Every now and then I was surprised to find how light a shadow can be, and although my second painting of a tea pot turned out much better, I still got the comment that I was too dark. Until today, when my teacher Nina complimented me that the charcoal drawing I was working on was 'exactly right'. Not too dark? Not too dark. The first semester is moving towards its completion, what remains after this week is a final week of evaluations. We'll see what happens. For now, I think I'll stick this one onto the wall above my bed: "And... always look on the bright side of life... Always look on the light side of life..."